Zeeland West’s offense is ridiculous. The Dux scored on every possession Friday night but the last, when they chose to kneel. That’s about the only time they weren’t running by Holland Christian, and won 66-36. First-year but veteran coach Jim Casserta will get this program going, but the Maroons’ tackling was as bad as when they played West last year. The Dux put 60 points on them then, which was a school record … until now. It was a field day for West’s trio of running backs: junior Marcus Lambert 252 yards, three TDs; senior Jon Pung, 199 yards, four TDs; senior Braden Werley, 184 yards and one TD. Lambert is the breakaway threat, and found pay dirt with rusn of 72, 65 and 63 yards. Punt also covered HC’s star junior receiver, Kyle Steigenga, all night, and had an interception. Werley is the most rugged and versatile of the backs. Both he and Pung have futures in small college ball. West’s defense has been suspect all year itself, and they lost two shootouts to open the season to Forest Hills Central and Zeeland East. With the Dux focused on slowing down Steigenga, Maroons senior QB Ross Schreuer picked it apart underneath and threw for 497 yards and two TDs, both to Steigenga, but with three picks. The top two prospects in the game were in the junior class, West’s 6-6, 290 tight end/d-tackle Jordan VanDort, and the 6-4, 185 Steigenga. VanDort seems to have a knack for rising to the occasion. Just when you think maybe the big boy is getting disinterested, boom, he was the first one into the backfield to stop HC on fourth-and-one. Steigenga had his fifth-straight game of 100+ receiving yards, with 166. His laconic demeanor belies big-time legs. With less than seven miles separating them, the matchup between Traverse City West and Traverse City Central is a marquee game for both schools each year. But this year’s crosstown rivalry game looks to be epic. With both schools entering this weekend’s game with undefeated conference records (and their best starts in years), an estimated 10,000 fans are expected at Thirlby Field this Friday night. For TC Central, success starts up front with their two big tackles, Tyler Gildersleeve and Mitch Brien. At 6-7, 280, Gildersleeve is one of the top tackles in Northern Michigan. He will be paving the way for the two TJ’s – speedster T.J. Schwannecke and dynamic dual-threat quarterback T.J. Schepperly. Schepperly is the key to Central’s offense with his ability to make great plays with his legs and through the air. His number one intangible is leadership, which has served the Trojans well. The Trojans have a very stingy defense with a strong front seven. They feed off of the experience and leadership of tackles Jordan Lutze and David Chauvette, along with linebackers Nick Bonaccini and Nate Pupel. The sleeper of the group is junior defensive end Mitchell Wynkoop. At 6-3, 220, he’s been able to get to the quarterback all season. He doesn’t have a household name yet, but opposing quarterbacks are quite familiar with him. The Titans will counter Central’s stout D with great speed on offense. West has a stable of good backs led by Geordan Carter and Griffin Forrester. They will also benefit from the return of freshman fullback Grant Ellison, who missed last week due to injury. But the bigger story on offense this season has been the emergence of senior quarterback Donny Cizek. Cizek is a quick and shifty quarterback who is completing nearly 70% of his passes. His top target is Tyler Johnson, a smooth-running wide receiver with good hands. Paving the way up front is junior Connor Hayes, a future Division I guard. On Defense for the TC West Titans, everything starts with middle linebacker Derrick Diver. Diver is the catalyst with his sideline-to-sideline playmaking ability. The Titans defense, as a whole, may be a bit overshadowed by the high-powered offense, but this group is talented. Coming off a strong defensive game over Cadillac last week, keep your eyes on Storm Eagle, Matt Lowe, and Dustin Tucker to make their presence felt against the Trojans. With so much talent on each sideline, it’s sure to be a great game. Beyond the game, however, is a deeper significance that seeks to unite a community rather than divide. This game marks the first-annual T.C. Patriot Game, which will honor military heroes from Northern Michigan who have lost their lives while serving in Iraq and Afghanistan. With all of the emotion, honor, and pride, Friday’s rivalry game is sure to be one for the ages. Mona Shores @ MuskegonThese are two of the top three teams in the O-K Black, along with Zeeland East. For the host school, a 5-0 mark and No. 1 state ranking is a return to historical form of the 21st century’s first decade. For Mona Shores a brave new world, the Sailors’ 4-1 start their best since their O-K Red days in 1989. Hackley Stadiuim, however, is not unknown territory to Mona Shores coach Matt Koziak. He was the head man on the Big Reds’ sideline in 2009, when they went 7-4, and was an assistant on state championship teams in 2006 and 2008. At the skill positions it’s a wash. If GR South Christian’s Jon Wassink isn’t the Lake Michigan area’s top 2015 quarterback prospect, then it’s 6-1, 170 soph Tyree Jackson. As good as he has been as Jackson’s favorite target, 6-1, 175 junior Asantay Brown has been incredible on defense with two three-interception games, against Grand Haven and Grand Rapids Union. An intriguing possible matchup could come with Brown at receiver against Muskegon junior DB 5-11, 175 DaSean Thrower. They were teammates last season at Muskegon Heights. Jackson has another talented junior receiver to work with, 6-1, 160 Marquon Sargent. Mona Shores will have no choice but to pass. Led up front by 6-4, 255 senior Ronald Jenkins and 6-4, 265 junior Kenneth Finley, and 5-11, 215 junior linebacker Will Hunt, Muskegon has wiped out the typically potent running games of Orchard Lake St. Mary’s, Rockford and Lowell. It will be the toughest test yet for Mona’s battle-tested senior line of tackles 6-2, 265 Brandon Gue and 6-1, 230 Jake Bordeaux, guards 6-0, 230 Alek Jend and 5-9, 225 Brandon Stafford, and center 5-9, 225 Collin Sullivan. For its part, Muskegon’s offensive line may be the state’s strongest, and make the Big Reds’ ground game so formidable. 6-3, 275 senior tackle Antwan Billings and 6-3, 280 senior Quincy Crosby lead a unit that includes 6-4, 275 senior Chandar Ricks, 6-4, 265 junior Malik King and 5-10, 252 senior guard Noah Tozer. Behind them, senior Jalen Smith does the ball-handling at quarterback in Muskegon’s veer triple option, and senior backs Marcus Smith and John Hall are both capable of big games on the ground. Muskegon is just too big, strong and talented where it matters most, and will win the game on the line, barring some miracle play-making by Jackson. The kind of true competitor who will knock your teeth out then shake your hand when the game’s over, and mean both with as much sincerity. Diver controls the middle of the field for the Titans and also is the team’s emotional leader. He’s an old school middle linebacker with great football instincts and a motor that doesn’t quit. He’s also an ace in the classroom with a 3.6 GPA and 26 ACT. Diver is drawing interest from Division 1 and Division 2 schools. It’s telling that in TC West’s big win over Cadillac, when there were any number of D1 prospects on the field, Diver was out there making plays and turning heads. Karcher is one of the few high school wide receivers that consistently catches the ball with his hands and not with his body. He has great speed — track guy who runs a true 4.5 — and good body control. He has been a major offensive weapon this year for the Warriors with nearly 700 receiving yards and 10 touchdowns in five games. He’s drawing interest from D1 and D2 schools and could be a player that contributes early at the next level. Hendricks is one of the myriad D1 lineman prospect in the Lake Michigan junior class. While it would’ve been nice from a scouting perspective had he stayed at Mona Shores, where he could be seen against the likes of the line from Muskegon, Mona’s Friday opponent, no one can say the move to Fruitport has gone poorly. Fruitport is 5-0 with Hendricks starting at left tackle and on the D line. Fruitport has a decent run-pass ratio, so Hendricks is able to practice both disciplines. He has a nice kick when pass blocking, while just swallowing Lakes 8 defenders in the run game. It’s no coincidence that in Dakota Gordon‘s 13 carry, 133 yard game last Friday in a win against Ludington, the majority came on the left side. With his 5.1 speed, Hendricks is able to get to the second level and keep plays alive, helping Fruitport be a big-play offense with Gordon and senior QB Tyler Feler. Hendricks’ best attribute: Balance. Needs work: Explosive hitting through his man, both offensively and defensively. Last week we talked about a big, all-around athlete, Plainwell’s Tyler White, who is somewhat overlooked because he doesn’t get many touches, just plays his role. Kaczynski is the opposite. Playing tight end, H-back and linebacker for Ludington, he tops the Orioles in tackles and receiving, and is their third leading rusher. In Ludington’s only win, against Muskegon Orchard View, Kaczynski ran for two TDs and caught another. Catching the ball, he’s rarely brought down by either the first or second hit. He probably projects as a MAC recruit if: as a linebacker, he can turn and cover; as a tight end, he can get a respectable 40 time at a combine. For his size, Kaczynski doesn’t look to have a particularly long or smooth stride like you see from a down-field tight end threat. Smith is a really good two-way player, a physical specimen starting at fullback and linebacker for undefeated Boyne City. On offense, he runs with power but also has really good feet and enough speed to break away. On defense, Smith is a sure tackler and stays around the ball, and doesn’t shy away from physical contact. 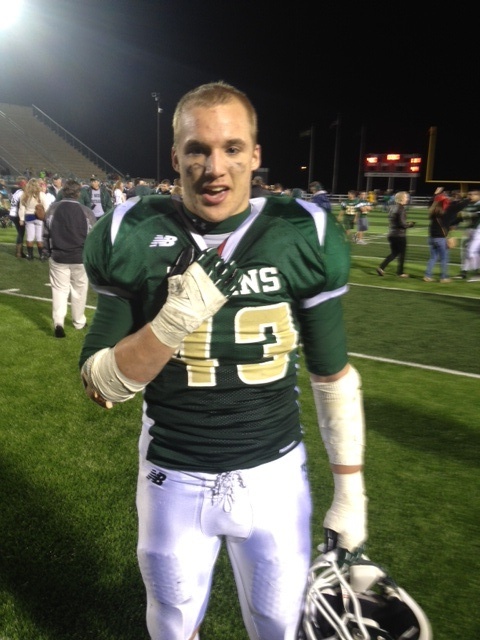 On a cold night at Thirlby Field, Traverse City West was on fire — on offense and defense. The Titans racked up nearly 400 yards of total offense en route to a 40-11 win over Cadillac. This game marked Cadillac’s first loss of the season. Offensively for West, quarterback Donny Cizek was a cool customer with a perfect completion percentage at halftime and three touchdowns. His favorite targets were fullback Geordon Carter, running back Griffin Forrester, and wide receiver Tyler Johnson. Johnson has good size, solid speed, and is a very good route runner. There could be a place for him at the next level. Up front for the Titans, Connor Hayes, again, was dominant. He’s not overly athletic, but he’s a mauler and plays with really good pad level. He could actually play center or stay at his current guard position in college. He’s a BCS recruit, following in the footsteps of recent TC West grad and current Oregon sophomore lineman, Jake Fisher. The Titans’ offense was spectacular in the running game and the passing game. Cadillac managed to hang with the Titans early on, largely in part to their two Division I tackles Jack Ford and Riley Norman. Ford is a lunchpail type of lineman who is fundamentally sound and plays to the whistle on every snap. CMU is getting a true workhorse. Norman is a beast and plays with an attitude — in a good way. At 6-7 and nearly 300 pounds, this track & field scholarship commit for Michigan State could be a future NFL’er if he decides to try football for the Spartans. The other standout on offense for the Vikings was quarterback Jalen Brooks. Brooks, a junior, rushed for 268 yards including an 80-yard TD run. He’s getting looks from Division II schools at the QB position, but could sneak into a MAC school if continues to improve as a pocket passer. Watching Brooks harkens comparisons to former CMU great Dan LeFevour. Putting a stop to the Vikings’ offensive efforts was middle linebacker Derrick Diver. Diver did everything besides take the tickets and pop the popcorn. He’s a throwback linebacker that plays sideline to sideline, making bone-crushing hits. He’s a leader and the heart and soul of West’s defense. Diver is drawing interest from Division I and Division II schools. Memo to all of those schools: offer this kid a scholarship now. You won’t be disappointed. Diver can flat out play. The other defensive standout for TC West was sophomore cornerback Zach McGuire. With really good size (6-1, 180) and good speed, he has potential to become a Division I prospect. McGuire has good cover skills and is a ballhawk. In the end, TC West’s depth proved to be too much for Cadillac to handle as the Titans pulled away with a big victory. But don’t count Cadillac out just yet. They will be one of the top teams heading into the Division 4 playoffs, but tonight belonged to the Division I Traverse City West Titans. This is the kickoff week for intra-league play in the O-K White, which looks like the strongest conference in the Lake Michigan area. Caledonia, 4-0, is the only unbeaten team in the mix. How long will that last? Against winning teams, Caledonia slipped past resurgent Mona Shores 22-19 (or just “surgent”, as Mona’s rarely been very good) then beat “undefeated” Grandville last week 14-7. So, while the Scots’ defense is allowing under 10 points a game, those stats are built with wins over helpless Holland and Middleville. Conversely, there’s been on fat on GR Christian’s table. After the Eagles’ 42-34 loss at nationally-ranked Cincinnati Moeller, they’ve gone on a rampage, destroying Kenowa Hills 43-0 and Hudsonville 59-13. Senior QB Alex VanDeVusse oversees Grand Rapids Christian’s potent offense. He has completed 61-of-94 passes for 11 TDS to four different players while running for 245 yards and three TDs. He has a couple of outstanding lineman in front of him, 6-1, 270 senior Alex Korhorn at guard, 6-5, 240 junior Tommy Doles at tackle, and at tight end Zach Crouch, a CMU recruit. VanDeVusse’s favorite target, not surprisingly, is junior All-American receiver Drake Harris. The Michigan State commitment has made 22 catches for 453 yards and 5 TDs. On the other side of the ball, the Eagles have some young play-makers, but it all starts with senior linebacker Matthew Hall who leads the team with 30 tackles and is one of three GR Christian defenders who have already scored a TD. Caledonia’s defense has proven adept at turning over their opponents, and that might be their best chance to keep it close against GR Christian. Five players had picks thus far, including two by senior Justin Krueger, who is also Caledonia’s top receiver. 6-3, 180 senior QB Ryan Zoet has been a tough run/pass dual threat. With Petoskey’s fall from grace, the Big North Conference looks like it’s down to a three-team race amongst Cadillac, TC Central and TC West. Two of those meet Friday when Cadillac, 4-0, 2-0, heads to Traverse City West, 3-1, 2-0. Neither team has been challenged in the Big North, with Cadillac rolling over Petoskey and Gaylord, and West beating up on Gaylord and Alpena. West has also proven itself against solid West Michigan competition, losing a close one at Kenowa Hills, then winning a close one over Grand Haven. The Vikings and Titans are similar in that they play defense and take care of the ball. West, in particular, has benefited from its takeaway margin. The strength of Cadillac’s defense is up front, led by behemoth seniors Riley Norman and Jack Ford, with junior linebacker Trevor Oliver cleaning up behind them. They’ll get to bang against another D1 lineman, West junior guard Connor Hayes. Gaylord was limited to under 100 yards total offense last week. West’s D is led by Derek Diver, a senior born to play middle linebacker at 6-3, 218, while junior Jordan Stevenson is solid at OLB and 6-4, 218 defensive end James Peck can be a playmaker when he gets into the backfield. Alpena was held to 110 yards total offense last week. This game will also feature the Big North’s top QBs.West senior Donny Cizek was injured last season but is making up for lost time. He’s 37-53 throwing for 522 yards and seven TDs, and has run for two more scores. He has a number of weapons at his disposal, most prominently junior Grant Balino, a run/catch threat out of the backfield. While Cizek is a solid quarterback who can control a game, his Cadillac counterpart, junior Jalen Brooks, is a dynamic talent who can take over a game, the perfect complement to the Vikings’ big senior line. He wasn’t the only running threat against Gaylord, as Tanner Derror rushed for 114 yards. Portage Central had a heart-breaker last Friday, losing 41-40 at Stevensville-Lakeshore. But at least, for the first time this season, the 3-1 Mustangs put their best team on the field. The Lakeshore game marked the return of Jeppesen, who had missed the first three games with that long-time high school season killder, mononucleosis. Jeppesen, who committed to Toledo, is one of the most athletic, versatile college-sized lineman in the Lake Michigan area. With him back in the lineup, against Lakeshore, Jacob Allan ran for 135 yards and two TDs, DeJuan James 87 yards and two TDs and QB Ryan Mergener 82 yards and a TD. The football commodity the Lake Michigan area produces most consistently is linemen. None of them were prep All-Americans. None of the five offensive linemen currently in the NFL even had Big 10 offers — Joe Staley (Rockford/CMU), Jared Veldheer (Forest Hills Northern/Hillsdale), Todd Herremans (Ravenna/SVSU), Joe Berger (Newaygo/Michigan Tech) and Cameron Bradfield (Grand Rapids Creston/GVSU). Such was the history and potential that saw us arrive last Friday to see Hopkins shut out Grand Rapids NorthPointe Christian 28-0. On Hopkins line at left tackle is one of those big, raw West Michigan boys, Matt Modreske standing a head taller than anyone else on the field. I liked how he got into the second level, and it looks like he’s been working on his body, with some triceps definition when he got in his three-point stance. Technique-wise is where Modreske has to improve, taking full advantage of his reach. Undefeated Hopkins plays with two tight ends and does nothing but run, so who knows what Modreske’s pass-blocking looks like. No one is promising a future like the five pros mentioned above. but he is a GLIAC project with big upside. In the preseason, we ranked Plainwell tight end Tyler White the No. 5 senior prospect in the Lake’s area. Anyone who has looked for his stats since then, may think we’re crazy. He mostly blocks for the 3-1 Trojans. He’s ranked so optimistically because White, the one-time running back, “looks like you’re supposed to look,” as one college coach put it, 6-6, 240 and can move. He’s one of two senior tight end prospects for Plainwell, along with 6-4, 235 Chance Terry. MLive’s Scott DeCamp broke down how both affected the game in Plainwell’s 23-7 win over neighboring Otsego. OK, enough blockers, how about a runner? Ware has been a one-man gang for Baldwin. He ran 14 times for 285 yards and three TDs and caught two passes for 49 yards and a TD last Friday in a rare, but emphatic, 48-13 win over Manistee Catholic Central. Ware is a GLIAC kid who MAC schools are starting to show interest in despite playing at a Class D school. He was a standout at our Traverse City combine in July, running a 4.6 40 with a 9’8 broad jump, 4.3 pro agility and 28.5″ vertical. Part of the Muskegon Machine that is 4-0 against the state’s toughest schedule. Hunt is a smart football player that doesn’t stay blocked. He’s never the most athletic player on the field, but makes a lot of big plays. Hunt is a throwback linebacker with great instincts, the kind of kid who eats, sleeps and drinks football. He’s a D1 prosect with Big Ten and MAC interest. Sticking with the lineman theme, the Big North has two potential standouts in the 2016 class — 6-2, 260 freshman Tommy Roush of Petoskey and 6-4, 270 freshman Thiyo Lukusa of Traverse City West. Both of these guys aren’t just pubescent freaks, they have legitimate athletic resumes. In July, Roush, the son of Petoskey track and field coach Kevin Roush, placed fifth in his age group nationally in the shot put and 12th in the hammer throw. For his part, Lukusa was the starting center for Parallel 45, one of the state’s top five 14U AAU basketball teams with a 39-7 spring record.